One of the strangest aspects of the referendum “debate” so far has been watching people who claim to support a particular outcome rubbish the very thing they claim to prefer. Thursday’s Newsnight, after Osborne came to Edinburgh to “veto” the currency union, provided two striking illustrations. The first was a no voting businesswoman who professed herself delighted by Osborne’s speech. When pressed whether if independence happened she would therefore argue against a currency zone, she almost sounded taken aback: no, if it was a yes vote, she would definitely support a currency union – keeping some elements of Britain was, after all, what she wanted. The second was Kirsty Wark’s insistent and often aggressive emphasis on one element of the currency union “as proposed”: that was the length of it and how bound into it Scotland would be. So the two main currency argument from the no camp appear to be these: firstly, you’ll cede a little sovereignty in monetary policy with a currency union, therefore you should just vote no and cede all monetary, fiscal and political sovereignty as you do now. And secondly, a currency union is a terrible idea for both sides and will never happen for that reason, and because the White Paper doesn’t suggest locking both sides into it indefinitely, you’re not on. It doesn’t take a political genus to notice the glaring logical inconsistencies. These arguments however, are not the first examples of unionists arguing against what they claim to want. It builds on their earlier “devo-max” mistakes. All parties and media claim to see more devolution as the way forward. Yet Scottish Lib Dem leader Willie Rennie – the Liberals who have had a policy of home rule since the 1880s – laid into Martin Sime, the SCVO chief executive as being some kind of “SNP stooge” for even discussing it back in 2012. Similarly there is glee among those who claim to support the EU for any statement from Barosso that suggests the EU might kick us out, and in turn kick Spanish fishermen out our fishing waters. There is a sense that any kind of discussion about Scotland’s future beyond, “do what we tell you” is a gift or concession to Alex Salmond, rather than the most obvious democratic way forward from where we are now. “Alex Salmond must name his plan B”. Why? Plan A, the currency union was not, as Alistair Darling claimed, “dreamed up by Alex Salmond” but by the Scottish Government’s Fiscal Commission Working Group, including Sir Jim Mirrlees and Joseph Stiglitz. They were tasked with looking at the best way forward for Scotland and the UK. It will need to be negotiated after a yes vote, and that has always been accepted. If, and only if, those negotiations fail to produce something workable will a plan B be required, and this will almost certainly be using the pound Sterling anyway until it suits us to do something else. Ireland used it for 30 years following a far more bloody independence from Westminster. Beyond that, the decision is one for a post-independence sovereign and democratic Scotland, not “Alex Salmond right now”. Lines like “lose the pound” or “not able to keep the pound” are of course, straight out lies. The current SNP government cannot and should not tie the hands of any government we elect in 2016. They don’t have a mandate to do that, having been elected only on devolved issues and holding an independence referendum. They don’t have mandate to pre-negotiate a currency union that will lock Scotland in for 50 years – the term being pushed by Wark on Newsnight. It may well be that in 2016 a party is elected which agrees with Dennis Canavan, Patrick Harvey, Pat Kane, Jim Sillars and the many others who want to do something different. This isn’t a weakness in the Yes campaign – it’s a fledgling new Scottish democracy. Their ideas will win out if and when people are convinced by the arguments. Seen in this light, the no campaigns tactic is near suicidal brinksmanship. It is pre-negotiating but in an entirely public manner, using the front pages and news programmes to undermine the whole idea of any kind of currency union in both England and Scotland. 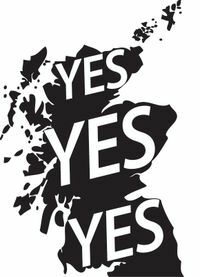 The main problem for the NO campaign there is that if there is a yes vote in September, the people who will be most keen for a currency union will be no voters. Those who didn’t want independence in the first place will want, as the business woman on Newsnight said, to retain as many links as possible. Similarly the argument that, “the only way to guarantee the British pound is to vote no” is one that will play best by far with already hardened supporters of the union. And from the UK government’s point of view, after a yes vote, London will want to retain some control over Scotland. It is not “the SNP” or independence removing that option from them, but the leaders on their own side. Because if the vote is won in September, and won despite a currency union being “vetoed” in most people’s minds, and entirely undermined publicly, that makes the UK government’s negotiating hand far weaker, especially in terms of forcing Scotland into one long-term against its will. Their own words will be used against them time and again. Salmond is a clever politician, largely because it’s rarely clear what he actually “wants” beyond independence. In achieving that, he realises he has to take people with him and that can involve going at a slower pace than those at the front might prefer. He argued for devolution, despite many on the pro-independence side arguing against because it didn’t go far enough. He left doors open for supporters of devo-max to put it on the ballot paper. He is now offering a currency union despite many on his own side – and those on the no side – arguing it’s not independent enough. Sure, this is political expediency to an extent, but it’s also good leadership, especially in having world-renowned economists devise the plan. Whatever the result, he – and most in the independence movement – would happily live with it as the next phase on a journey, until the electorate at large are ready to move on. By contrast, it represents a huge gamble to oppose what is your own best scenario if you lose. This mistake was made with devo-max in 2012. It is now being made again with the currency union, which could be the best route to some kind of federal UK – again often stated by unionists as the best way forward. It’s also been termed independence-lite by some in the independence camp – a kind of independence that leaves some of the UK remaining. So where does that leave our unionist business woman so delighted by Osborne, but who in reality, wants to retain a Sterling union after a yes vote? Where does it leave all those who claimed to support a more federal UK, but who spent the entire campaign rubbishing anyone attempting to argue for it? Surely those voters need to wake up and see the bigger picture – that this is not all about Salmond and taking a pop at anything he appears to be advocating. Politics and negotiations may be a game of poker with bluffs and counter bluffs, but these are dangerous games even when played behind closed doors with experienced players. Played out across front pages in a febrile atmosphere, arguing against and undermining an option that you actually want or need makes no sense at all. When the history of independence is written, people may find themselves looking at the White Paper with it’s multiple offers of co-operation and independence-lite and shake their heads at how inept Westminster must have been in order to mis-read and mis-represent it to the point they made co-operation entirely impossible with their newly independent neighbour. “You can’t make us co-operate and it’s just an assertion by Alex Salmond that we will, so you’d better just do as we tell you” is a pretty poor message, especially when it appears to be the only one you have. has any one published a proper rebuttal of MaPherson’s document. I can’t see how a temporary currency union is in the rUKs interest at all readin this. Its here you find them pedalling swivel eyed logic as they assert boldly that “Dependence on something bigger than yourself.” While rubbishing the idea that Scotland contributes anything to the whole.Having done this, you then watch dumbfounded as they attack this dependency as a weakness, not a strength. For example Johann Lamont’s “Something for nothing” speech or Ruth Davidsons assertion that 9 out 10 Scots contributed nothing to the wealth of the UK. They dismiss the idea of Scottish culture but claim that the UK would be diminished without us. The proclaim that they feel deep shame at seeing the Saltire in public, yet seem to ignore that the Union Jack which makes their little hearts swell with pride and joy, is in fact a composite flag made of the St George’s Cross and the Saltire. They talk about World war 2 and how we helped defeat the nazis – yet lazily claim that anyone who is a SNP voter or is considering a yes vote, is a Nazi of sorts. They also like to talk about how if we were already independent, we would have been invaded by nazis and they would not have helped. The “they” in question are Scottish MPS & MSPs who seem to forget that in this fictional independent Scotland, they and their parents would have been victims of English truculence. George Osborne says we can’t use the pound. While claiming that we have no stake in the UK, he forgets a report written in the last dying days of John Majors government, that stated quite clearly that Scotland contributed 17.9% more in tax receipts to the UK treasury than it got in the block grant. But then labour has a similar blind spot to the truth. The party that buried the mccrone report, then sends out Lamont to claim that the welfare spending element of Barnett is in fact “English money”.The daily record crowed about how thatcher once wanted to grab half a billion from the Scottish grant – yet goes strangely quiet when it is revealed that UK Labour had with the connivance of Scottish Labour, transferred around 1.5 billion a year to the UK treasury from 1999 to 2007. yet Scottish labour keep on insisting that they and only they can keep the Tories out. But they still haven’t said what the union is for? Other than you accepted it before so why not now. My answer would be – This is the first time I have realised its there and it don’t half look old and ugly. Thanks for the article Cath. I enjoyed reading it. The same condition applies to the rUK Westminster government. The posturing of Ed Balls and Danny Alexander under George Osborne’s leadership is surely meaningless given there is a General Election in 2015. It cannot be for three individuals to tie the hands of the entire British Isles for the rest of time. Pragmatism will win the day. The reaction of the ‘No’ voting business woman alludes to this. People tire of hearing anyone, or organisation, constantly harping on about things that can’t be done. This is probably why people have stopped listening to Alistair Darling. People become increasingly suspicious about such an entrenched position. This makes them seek out independent information and get involved in open discussions. Knowledge of what is possible builds confidence to vote Yes to Scotland to being a country running its own affairs. The most logically cohesive, comprehensive and accurate piece I have read on the currency issue so far. That was a currency peg, not a currency union. The former is dismissed as a viable prospect in one short paragraph in the relevant Fiscal Commission paper. They could be wrong, of course, but that isn’t the argument Yes is making. Meanwhile, the idea that every significant Westminster party, together with the BoE, the Treasury and the overwhelming majority of qualified observers are collectively bluffing is floridly delusional. As well as grossly dishonest to the Scottish electorate. Ireland’s course was “sterlingization” through masterful inactivity from 1922 to 1928 and then a currency board. But in practice UK notes and coins were (anecdotally at least) common indeed in the Free State. And on that note, it is unlikely – based on Bank of England statistics – that “real” Bank of England money makes up more than 75% of notes and coins circulating in Scotland today. So the situation now in Scotland may be remarkably similar to that which prevailed in Ireland for long after 1928. But that’s one for someone with more time and better research skills than I possess to investigate. Aargh! That should have been “makes up more than 25%”. It’s “Scottish bank” notes which make up over 75% of the stock. The Irish pound shadowed sterling before being floated as the punt. There is no earthly reason why a Scottish currency unit could not do the same with any world currency if that were considered advantageous. The pound sterling is a natural. It would in the transition period offer some stability. However, if after a Yes Westminster remains proprietorial and is not challenged in its view as continuing and legal successor state of the defunct United Kingdom, alternative measures may be necessary.I Cannot imagine the Edinburgh government has not planned for such an eventuality beyond simply not contributing to the UK debt burden. The blanket No from the Westminster based parties is nothing more than a blanket No to the idea of Scottish sovereignty, nothing else. The experts consulted generally have a history of opposition to independence so despite their claims to be nonpolitical they patently are. In this argument there is no such thing as the totally objective. Reality kicks in for all concerned on the 19th september. Then we’ll see who are the cool-headed, reasoned pragmatists. Nobody has said that an independent Scotland could not shadow the £, nor, obviously, could they. The only thing that’s been ruled out is a formal currency union. You’d certainly hope so, that would be spectacularly irresponsible. No, it’s a very specific No to a very specific institutional structure, one which would require the UK to pool monetary sovereignty and risk with a state which would have elected otherwise to reject its sovereignty. It’s hard to fault the logical consistency. Here’s a thing; unionists often go to great lengths to tell all and sundry that what’s on offer isn’t full independence. Meanwhile social attitudes surveys tell us that about 2/3 of the population support far greater devolution (i.e. not full independence) or independence. In other words, the NO campaign is expending a lot of energy telling Devo-Maxers that voting YES will actually give them what they want! As Napoleon Bonaparte once said, never interrupt your enemy when he is making a mistake. Unionist communication ‘operatives’ in particular have several challenges but strangely the most significant are linguistic or in contemporary speak ‘ message delivery’. It is not simply finding the appropriate issue- language with which to craft the argument, there is also the meta-language: finding the appropriate tone, accent, passion, anger-management and in the specific case of George Osborn dealing with the ever present smirk. But finding the appropriate vocabulary in the context of attacking nationalism is especially difficult. It is very easy for the No communicators to slip into a style and content that belittles, decries, discredits, dismisses beyond the boundary of the independence discourse. In attempting to discourage people from voting YES we frequently hear and read language that denigrates, deprecates and in some cases ridicules core cultural values. Often this is communicated by the use of angry scorn but with a tone of arrogant disdain in order to dishearten or infuse fear. Underrating Scotland’s potential with dismissive arguments that vilify in order to demoralize and engender a dispirited community of voters might just backfire. For better or worse that isn’t what we’re being asked to vote for. A Yes vote will give the SNP a mandate to negotiate a new state to come into existence in March 2016 (24th, I think). The next Scottish Parliament elections are not until May 2016. So the SNP will be negotiating on things like currency arrangements, national debt, EU membership etc. SNP are clear that people are voting to give them a mandate to carry out (or attempt to) the choices set out in the White Paper. So they will be going into the negotiations with that as the starting position, not waiting another 18 months which would be impractical. As such I do not think it is fair to say that the SNP will be negotiating, however I should say that I like to see the good in people and take them at their word and not simply assume the position of snipping cynic. Given their record in Government I am inclined to trust the SNP to keep to their word and ensure their involvement, it is after all in all of our interests. Again this demonstrates to me that the offer is progressive and positive. Of course it shall not be easy and there shall have to be compromises but better that (hope) than the alternative. Maybe one of your writers could check this out and present an article on it. Firstly, I was under the impression Kirsty Wark had been barred from presenting items on Scottish politics on Newsnight or, indeed, on the BBC after she took Jack McConnell on holiday during his time as Labour First Minister since she had declared a bias. Secondly, I’m sure I had read that she had been made to write to apologise to Alex Salmond after cutting him off abruptly in an interview. She did it again on Thursday.